An earlier post – Cultural tourism: its time is nigh – highlighted the immense potential for cultural tourism in the Donegal Gaeltacht to help fill the vacuum left by failed government policies, mainly by Údarás na Gaeltachta, to provide jobs and prevent the departure of our dynamic young to foreign shores. With the pursuit of major manufacturing companies a lost cause mainly due to difficult and expensive transport logistics and call centres being a short-term band-aid, cultural tourism has been an underused weapon in the battle against rising unemployment and severe economic decline in the Gaeltacht. While some say a minority of people such as language-based entrepreneur Liam Cunningham in Glencolmcille have become tourism millionaires, mainly based on national and international grants with Cunningham perhaps reaping the benefits of his chairmanship of Údarás for over a decade (whether questionable or not, meaning within ethical parameters, is a topic for future discussion), the depth of funding to other local cultural tourism entrepreneurs has been sparse. The reason, according to Udaras officials, is that cultural tourism doesn’t create long-term jobs. Asked why, officials are at a loss to explain, so what this long-held and somewhat irrational attitude is based on is a matter of pure conjecture, with some critics saying the real reason is unrelated to accepted principles of economic development but rather linked to cronyism, influence peddling and continued support, financial and otherwise, to Fianna Fail, a party that ruled the roost for so long and put certain people in key executive positions. In my opinion, the Latin term ‘genius loci’ (spirit of place) best describes what the central element is – the specific nuances of any given place that separate it from the rest of the world. So, does the Donegal Gaeltacht have what it takes? Cherishing an ancient language that proudly holds its place among the oldest in the known world; with the singing tradition of sean-nós, whose ornamented, rhythmic intimations are an inspirational reminder of the primordial beginnings of Man; and with the area’s unique traditional dance and music, disparate elements of ‘genius loci’ are plentiful. Not to mention the intriguing Celtic legends such as those related to Balor and Lugh, thus the Mount of Lugh (now called Errigal) named after the ancient Sun God. Having had the privilege over the last 30 years of travelling as a journalist on assignment to many parts of the world, I considered some of the places I’ve visited and successful cultural tourism projects there, projects that have not only strengthened the economic vitality of deprived areas but also uplifted the innate spirit and pride of the local population. Here are a few, some which might just provide models of excellence for the Donegal Gaeltacht. 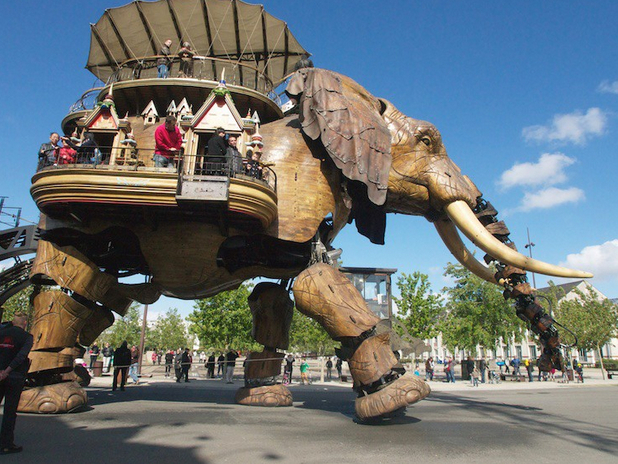 Creative engineering in Nantes, France, has led to economic revival based on cultural tourism. Nantes, France – Earlier this year, I travelled to this western town in the Pays Loire region to see such a project. Faced with empty industrial estates, local officials had decided to invest in cultural tourism to create jobs using the existing space and infrastructure. Realizing how watching ships return to this riverside port with exotic cargo from around the world inspired a young Jules Verne to later write science-fiction classics as ‘Twenty Thousand Leagues Under the Sea’ and ‘Journey to the Centre of the Earth,’ the officials embarked on a project that now attracts tens of thousands of visitors annually. Entitled ‘Les Machines de L’Ile’ and opened in 2007, it is a 21st-century mechanical wonderland consisting of monumental structures including the, ‘Grand Elephant,’ ‘Mantra Ray,’ ‘Sea Snake,’ ‘Heron Tree,’ and ‘World Carousel’ in what is known as the ‘Gallery of Machines’ upon which visitors enjoy adventure rides and experiences. Last year alone, almost 100,000 people rode on the Grand Elephant; 190,000 people visited the gallery and 250,000 the ‘World Carousel.’ Total investment – in various stages – was 17.7 million euro, a sum that was recouped within a few years. In comparison, according to Údarás, Largo Foods received around seven million euro in funding and left the area earlier this year. Not only did the project increase business revenues, it also created permanent, long-term new jobs in central workshops employing such tradespeople as plumbers, carpenters and engineers. Could a project like this – using local legendary Celtic figures as central subjects – not help deal with the empty industrial spaces throughout west Donegal, while attracting more tourists to the area? Puppetry, an age-old tradition in Sicily, attracts tourists and locals alike, providing both entertainment and cultural education. Palermo, Sicily – Like west Donegal, this rocky island at the toe of Italy has generally been ignored by the central government in Rome. Faced with worsening employment, local officials took matters into their own hands. Seizing on a peculiar and unique vein of cultural heritage dating back hundreds of years to the time of Socrates – puppetry – they created a flourishing tourism attraction that has boosted business and employment. ‘Opera dei pui’ (puppet theater) has a long tradition in Sicily, reaching its peak around 100 years ago on the island. 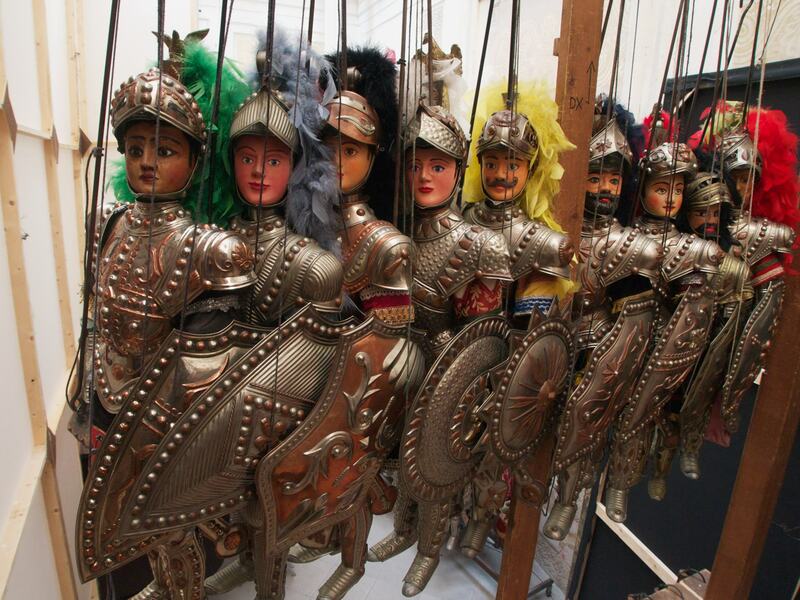 With support from the Association for Conservation of Popular Traditions, visitors to the downtown Palermo puppet museum can now see hundreds of beautifully designed puppets, their masters’ equipment (mestiere), as well as other memorabilia, and regularly-staged shows involving cultural characters and chivalrous heroes such as Orlando, Rinaldo and Gano di Maganza. So strong has been the resurgence of interest in this long-held tradition, puppet theatre performances – that also play an important educational role in highlighting the island’s history –take place in other parts of Sicily. Again, using local legendary figures and stories, can the Donegal Gaeltacht not avail of a similar cultural tourism initiative? A creative team under the guidance of Kathleen Gallagher has already shown the level of know-how required for such a project. 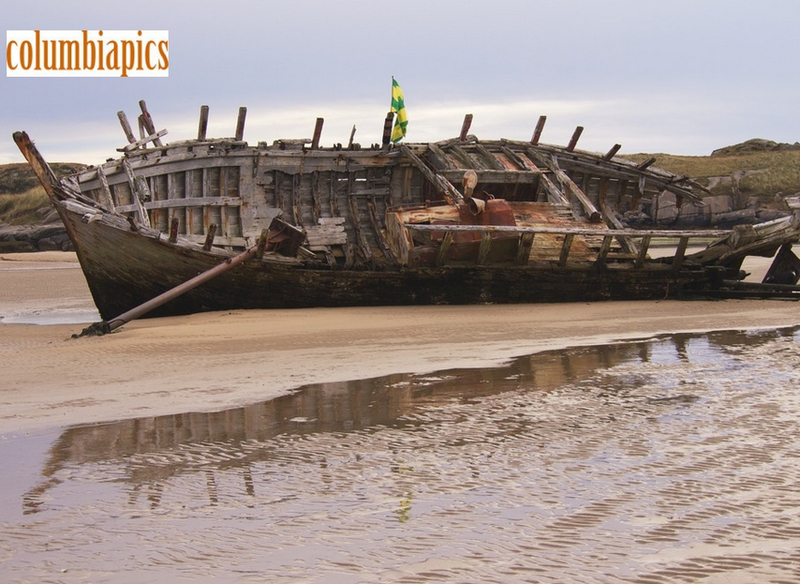 Donegal flag flies high over one of the area’s most well-known shipwrecks opposite Ostan Gaoth Dobhair. Many others lie offshore, spanning centuries of history. Key West, Florida – before it became a hotspot for tourism, this area on the tip of the peninsula was a backward, forgotten place in the 1800s where local fishermen and their families led difficult hand-to-mouth existences. Only when the phrase ‘Wreck Ashore!’ rang out did hope for better things arise. ‘Unloading’ the many ships that ran into difficulty was a chore, but a most rewarding one. Seizing upon this colourful aspect of the area’s history, local officials decided to create an attraction that would be both entertaining, as well as educational. Thus, the ‘Key West Shipwreck Museum,’ where visitors step back in time to discover Key West’s unique maritime heritage. The museum combines actors, video and actual artefacts from the rediscovery of wrecked vessels such as the Isaac Allerton, which sank in 1856 on the treacherous Florida Keys reef. Narrator and master wrecker, Asa Tift, and his wrecking crew tell the story of how this unusual industry created livelihoods for the early pioneers of Key West. Visitors can even climb a 65-foot lookout tower in search of wrecks. West Donegal, with its rich maritime heritage and its record of shipwrecks, including the sinking of Spanish Armada galleons off Tory and Gola Islands plus other vessels, both military from the two world wars and commercial, offers a similar historical backdrop to Key West. What’s to prevent officials funding such a project – except, of course, narrow-minded thinking and lack of specialised business acumen? This entry was posted in Donegal and tagged Balor, CeangalG, Celtic, cultural tourism, Donegal, Donegal Gaeltacht, economic development, Errigal, EU-funded, festival, Fianna Fail, Florida, France, Gaeltacht, Glencolmcille, Ireland, Irish, journalist, Jules Verne, Kathleen Gallagher, Key West, Largo Foods, Les Machines de L’Ile, Liam Cunningham, Lugh, museum, music, officials, Palermo, puppets, sean-nos, selling our story, shipwreck, Sicily, theater, travel, Udaras, Udaras na Gaeltachta, West Donegal. Bookmark the permalink. ← Columba: saint, soldier or New Age Pagan? My philosophy: if you have a new idea, go ahead and share it (as you bravely did). Or put it into action. Don’t be afraid of the doubts or disapproval of others. Often they’re simply the voices of envy, people upset they didn’t think of it first.